Newest technology gentle formula microgranular dust free blue bleach. Mix with JKS International Italian Cream Developer for optimum color results. - For Opaque Permanent results, mix 1 part JKS Color to 1 ½ parts JKS Developer. - For Translucent Permanent results, mix 1 part JKS Color with 2 to 2 ½ parts JKS Developer. - For Semi Permanent results, mix 1 part JKS Color with 1 ½ parts JKS Tone on Tone Developer. - For Demi Permanent results, mix 1 part JKS Color to 1 part JKS Tone on Tone Developer. - For 98% Ammonia Free Semi Permanent Translucent results, mix 1 part JKS Color to 2 to 2 ½ parts JKS Tone on Tone Developer. - For High Lifts, mix 1 part JKS Color to 2 parts JKS 40 Vol Developer. 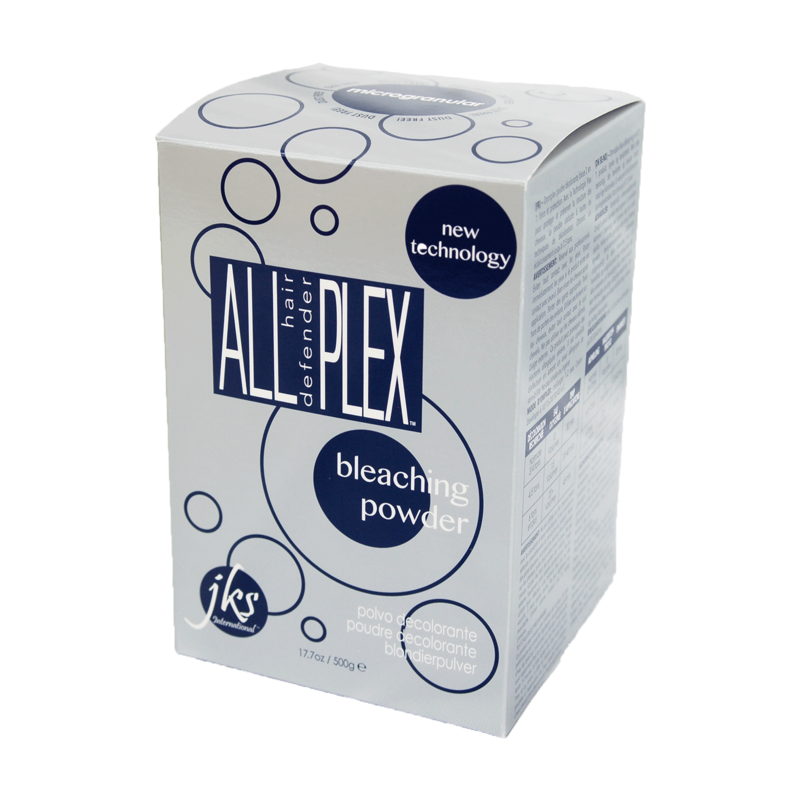 - Truly dust free, blue bleach which neutralizes pale yellow. - Requires less developer and allows you to achieve higher lift with a lower volume of developer which leaves the hair in better condition. - Earth friendly recyclable cardboard package, refill bags are available at less cost. "This Italian Bleaching powder has Plex Bond Protector #1 in it. My stylists tell me that they can bleach any condition hair or any dark level hair into whatever level lightness they desire without worrying about any damage to the hair. My stylists also tell me to follow through with the JKS All hd Plex #2 after the toner and shampoo and prior to the conditioner for optimal results. This is a game changer. Again, Great Value in a Superior Product Pair. Hard to find but it's possible with JKS."